Three new agents are currently undergoing clinical trials: anistreplase, intravenous urokinase, and prourokinase. Anistreplase (APSAC) is a complex of anisoylated lys-plasminogen and streptokinase which is injected in a dose of 30 U over 2–5 min. Reperfusion rates of 60+10% and patency rates of 70–75% have been observed when it is given in <4 h. Mortality was reduced 48% after anistreplase in one study (AIMS). Intravenous urokinase has yielded reperfusion or patency rates of 60–70% in limited trial experience, with equivalent effects of TPA in one trial (GAUS). Current usage includes a loading injection (eg, 1.5 million U) followed by a maintenance infusion (eg, 1.5 million U/60–90 min). Combinations of urokinase and TPA are also undergoing testing. Prourokinase is a fibrin-selective precursor form of urokinase undergoing initial trials both as a single agent and in combinations with urokinase and TPA. 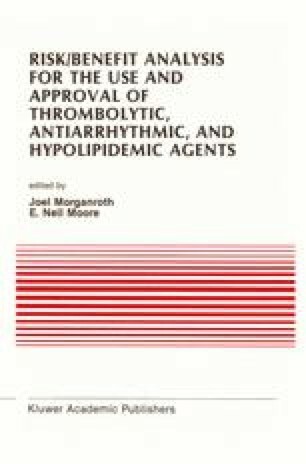 These agents expand the spectrum of thrombolytic options and may begin to impact clinical therapy in the near future.